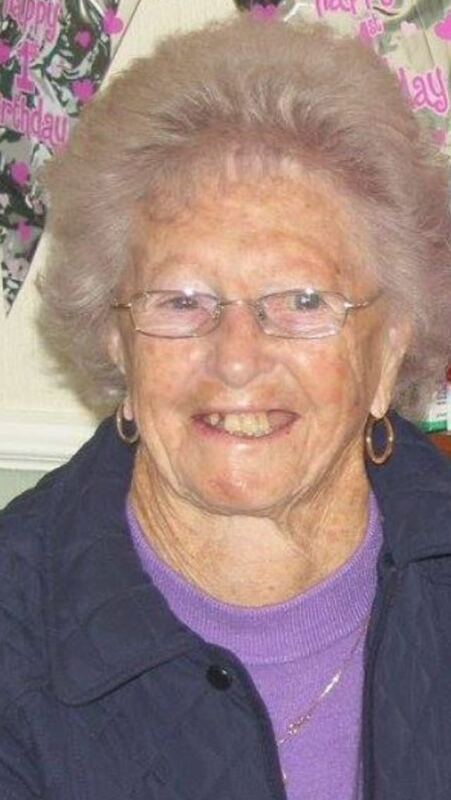 Anne (Nan) Doyle (née Timmons) of Bray, Co. Wicklow passed away peacefully at home on 11th April, 2018, surrounded by her family, beloved wife of the late Noel, adored mother of Trini, David and Susan, caring mother-in-law of George, Noel and Helen, dearly loved Nan of Philip, Lynette, Laura, Graham, Ian and great-grandmother of Lauren, Sadhbh, Grace and Rory; fondly remembered by her sister Lily, brother Hughie, nieces, nephews, relatives and friends. A gathering for family and friends will take place at Colliers Funeral Home, Old Connaught Avenue, Bray on Thursday, 12th April, from 5.00pm to 7.00pm, with prayers at 6.00pm. Removal from the funeral home on Friday, 13th April, at 10.30am to St. Peter’s Church, Little Bray arriving for 11.00am Requiem Mass followed by burial in Shanganagh Cemetery.